Mazda allows over 1/4" toe-in (measured at tires), front or rear. This will be "in spec" and eat up tires and mpg's. Alignment shops hope to do minimal adjustments for the fixed price deals. These 3 "back-up" links below show Alignments Spec's based on a Shop's Alignment rig software. They may show averaged Generalized Specs for all M6 & MS6 models. Best to use the better link above. Ask for their before and after alignment data sheets. If you're into racing type handling, SPC adjustable front ball joints are a must. Mazda front camber spec is between +.7 deg and -1.28 deg. I'd start at 1.2 deg negative. +/.- .2 deg. This will also reduce excessive wear of the outer edge when enjoying the curves. For autox, drag, or circuit driving, others can suggest more aggressive spec's. But this gets you in the right ball park for normal use. If you run wide 40 series tires, and don't corner hard a lot at track events, high neg camber (-2 deg or more) will wear out the inner tire edges. The MS6 has same front upper control arms as the M6. Lower control arms have stiffer bushings. * Hunter uses a Reference Tire Diameter for all of their car toe-in mearurement conversions from degrees to inches or mm's. They use 28.65 inches or 727.7 mm diameter, regarless of the car's actual tire size. For quick conversions to degrees from Hunter results or spec'n displays in inches: 2 x inches = degrees . Note your typical MS6 tire is about 25.6 inches at the tire OD. 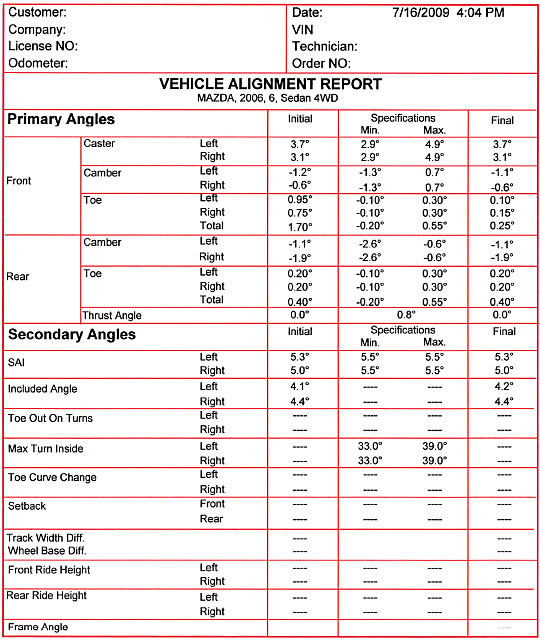 1) IF you have a link to the Mazda6 alignment spec'ns, even by way of an alignment sheet that includes the spec'ns, please send me a message and I'll include it here. 2) IF a link no longer works, please send me a message and I'll try to fix it. Thanks man. VERY good information for everyone here. This should be stickied. I can second your findings as I have my alignment set within the specs you posted. Not only am I netting better mpg, but, my tires are not wearing on the edges after 2k miles, and the car isn&#39;t drifting like it used to. I&#39;m not too worried about cornering harder since I&#39;m in TX. We don&#39;t have many curves. I&#39;ll post up my alignment specs when I get a chance. 2006 Mazdaspeed6 I LOVE this car! Thanks for this information. I don&#39;t pretend to understand it all, but what I&#39;d like to know is how many "mpg" are we talking about here if one car is at the worst extreme vs the best extreme for mpg on the toe in? Not happy with my mpg so far and interested in anything I can do to improve it. 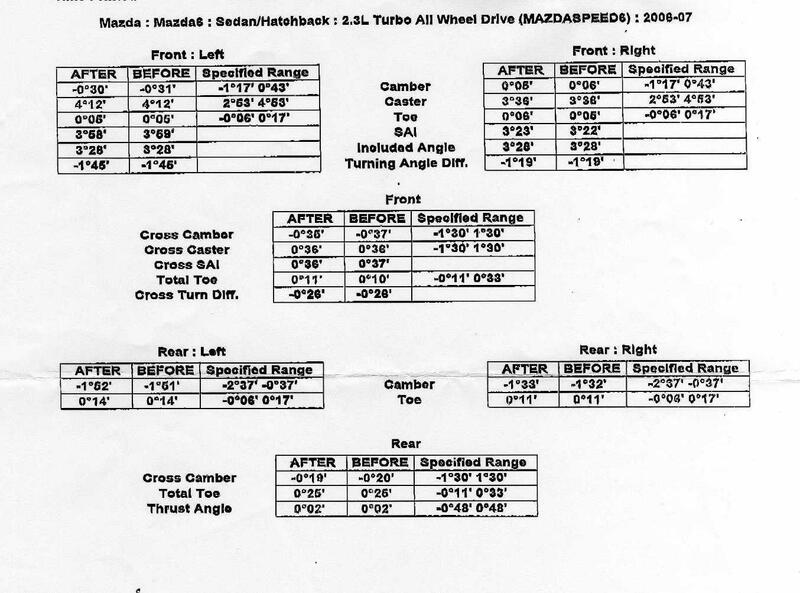 You know, this info s/b posted as a sticky as I had my alignment done twice ... once "to spec" and then again to fix the camber on the back. 2007 MS6 sold .... new wheels = G8 GXP manual. Car handles like a dream . I do not expect the tires to last long. I used the spec posted above with -1.2 camber in the front. As I posted before, it feels like the car just lost 1000#&#39;s. Turns in more like my Mx-5, not like the heavy pig it was. Main reason I did it was to cure the chewing up of the outside edge of my Proxes 4&#39;s, which occurred after 1000 miles of straight interstate highway driving. I have sinced put the summer tires on, 235/40 T1-r&#39;s on Rx8 rims and just did not want to see those chewed up as well. alright, you&#39;ve convinced me to get the spc ball joints. good info kevin. sticky please. I haven&#39;t ordered SPC ball joints yet, but my setup is 0.00 toe front and rear, and -1.0 degree camber in the rear. Once I get the SPC ball joints I"m going to run -1.5 degrees in the front and toe out the rear 0.1" The car handles crazy now, I&#39;m on Eibach Sportlines with Koni shocks, and both RB sways with AWR endlinks. -2.3° in front -2.0° rear with zero toe all the way around. I should have the toe set out a little out in the front, but this is a daily driver first and the tires will wear out fast enough with the camber settings. For reference, at the track, I&#39;m running 245/35-18 Hoosier A3S05&#39;s with phenomenal results. The combination of a good allignmnet (requiring adjustable ball joints in this case) and sticky tires really wakes this car up: worth every penny for both. It looks like the allignment and tires picked up between 3 & 4 seconds (out of 55 or so) at the autocross over the stock allignment and the Falken Azenis, which is an eternity in an autocross. 2007 BMW 328i, very stock with Navigation, which is kinda cool because you can playback MP3 DVD&#39;s through the navigation system. 4.7 Gigs of MP3&#39;s is a real blatter buster! James, with the 245/35 Hoosier tires and the negative front camber, do you still have clearance between the front tires and the suspension on the inside of the tire? I just got 245 Azenis and when I put them on, there is almost no clearance left on the inside. I have the adjustable ball joints waiting to be installed, but I&#39;m not sure I even have room to add negative front camber with the autocross tires.